The Philippines’ investment grade improvements turned the country into a viable investment site for foreign investors, its status affirmed by credit ratings firms such as Standard & Poor’s that dubbed the country as Southeast Asia’s economic leader. Recently, Moody’s Investors Service has also upgraded the Philippines’ rating to “investment grade” and has also revised its outlook for the country’s debt rating to positive which indicates the possibility of another upgrade in the next 12 months. The real estate boom happening all over Metro Manila and in other key cities nationwide is just one of the many indicators that the country’s strong economic performance will continue. Daiichi Properties, one of the notable real estate developers in the Philippines and known for its Grade-A high-rise office towers such as The Taipan Place and The Orient Square in the Ortigas Business District, validates the observation of investors about the country. Daiichi has been a significant contributor in shaping the real estate environment in the Philippines since 1992, and the real estate firm’s latest innovative projects and developments certainly put it in a position to air its views on how optimism can be sustained in the industry. I recently spoke with Charmaine Uy, Senior Vice President of Daiichi Properties, on the latest updates and developments. Sasha Zeljic (SZ): What are the key factors that make the Philippines an ideal investment destination for real estate? Charmaine Uy (CU): The Philippines’ current economic conditions provide both a very conducive platform and wealth of opportunities for the real estate industry to grow and expand exponentially. There’s just so much promise and potential. Apart from the investment grade status upgrades by major international credit rating firms Fitch Ratings and Standard & Poor’s, prudent fiscal and monetary policies as well as good governance contributed to this viable investment climate. Another positive development is the Bangko Sentral’s (Central Bank) move to ease out P1.79 trillion from the Special Deposit Accounts, which certainly helps sustain low interest rates. SZ: Is the upbeat sentiment of the real estate industry in the country sustainable? CU: I think the heightened interest in the Philippines will enhance requirements for office and residential space. Even the increasing office space demand from multinational companies and BPOs will sustain the office market. Added factors include strong liquidity of the banking system along with low interest rates and stable price schemes brought about by encouraging economic growth figures. SZ: What is the role that Daiichi Properties plays in providing the positive outlook for the real estate industry in the Philippines? CU: An active participation in property developments contributes to the positive real estate outlook, and Daiichi Properties intends to be a part of this growth. Daiichi has consistently delivered high-rise, high-end commercial and residential developments since 1992. The company has so far completed five high-rise Grade A development projects, namely The Taipan Place and The Orient Square in Ortigas Center, Lee Gardens in Mandaluyong City and Regent Parkway and One Global Place in Bonifacio Global City (BGC). Consistent with its professional track record, Daiichi has delivered and will continue to deliver world-class commercial and residential high-rise projects. With a commitment to achieve only the best in terms of quality, competence and client satisfaction, the company has resolutely forged alliances with respected institutions in the industry to accomplish this purpose. SZ: What are your upcoming projects in the country? For developers, what is the impact and significance of being LEED-rated? CU: The upcoming projects and the ones that are in current development are concentrated in Bonifacio Global City, namely One World Place, World Plaza and DP Tower. These projects are targeted for completion between the periods 2015 and 2017. Prospective locators would be multinational companies, notable financial institutions and respected organizations. One World Place, a 31-story office building, has a lot area of 1,790 square meters. The building has four levels basement parking and six levels podium parking. It features ground floor for retail space, 22-level typical office space and penthouse level, executive office and mechanical deck floor. The facade is covered with fully unitized curtain wall system on all sides with a combination of glass and aluminum composite panels. World Plaza, on the other hand, is a 27-storey office building located on a PEZA-registered I.T. park in BGC with a lot area of 2,731 square meters. The building has three levels of basement parking and six levels podium parking. It also has a ground floor retail space, 18-level typical office space, penthouse level and mechanical deck floor. One World Place has achieved status as a Pre-Certificated Gold level LEED project by the U.S. Green Building Council, while World Plaza and DP Tower are aspiring for LEED certification. LEED is a “sustainability tool for transforming built environment,” hence aspiring for energy efficiency, environmentally friendly and socially responsible structures that will result in the improvement of the quality of life not only of its locators but also impacting on the surrounding environment. SZ: What makes Bonifacio Global City a prime real estate site? CU: Bonifacio Global City is a strategically located premier business district near other central business districts and the Ninoy Aquino International Airport (NAIA). It is easily accessible with multiple points of entry, well-managed thoroughfares and transport linkages. The area has an excellent business climate, abundant labor market, well-planned infrastructures and energy- efficient districts, fully integrated and adaptable utility systems. The site is truly an exceptionally master planned location. SZ: Why choose to partner with Gensler in these projects? 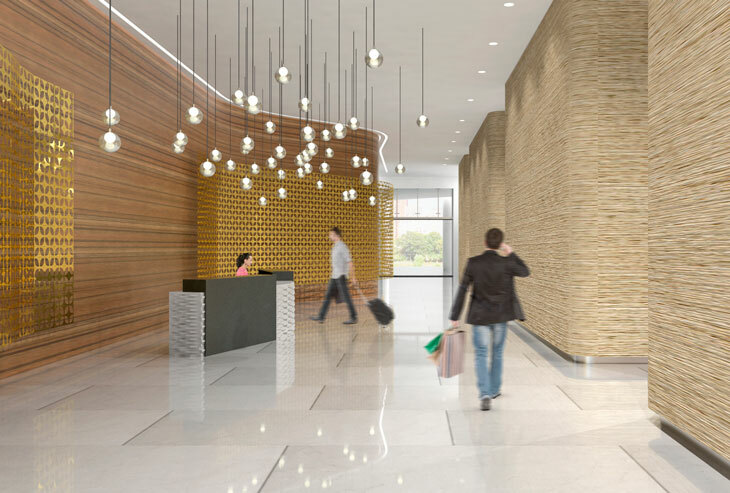 What is it about Gensler that makes it the perfect partner for Daiichi? CU: Back in 2011, following Daiichi’s aspiration to position itself globally, the company hired Gensler to design its third building in BGC known as One World Place. This building subsequently won Best Office Development-Philippines at the Asia Pacific Property Awards held in Kuala Lumpur, Malaysia. Over the course of the last two years, Gensler’s relationship with Daiichi Properties evolved to the next level. Currently, Gensler is working with Daiichi Properties on developing our second office tower in Fort Bonifacio called World Plaza, along with integrated building signage and identity. Additionally, a third tower is at the drawing board for Gensler in late October, with the project larger in size and scope. The competitive advantage brought about by Daiichi and Gensler’s partnership will serve as a progression and innovation not only of our projects’ design and function but also of ideals, prioritizing excellence and sustainability in the service of its clients, investors and partners. Sasha Zeljic is a regional practice area leader for Commercial Office Buildings in Gensler's Chicago office. With a strong emphasis on research and implementation of sustainable design, Sasha is particularly interested in exterior envelopes and conceptually advanced high-performance building façades. Contact him at aleksandar_zeljic@gensler.com. Hello... Sasha Zeljic I really want to know more your expertise about real estate in the Philippines. Email me at AaronAPeralta123@yahoo.com. Thank you. The view was something lovely. Hope to visit the place soon. Thanks for sharing this info.